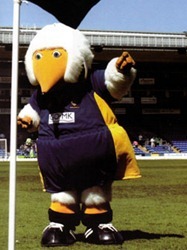 Wandle was the mascot of Wimbledon FC football club for three years, from 2000 to 2003. He was named after the local River Wandle and created by Wimbledon-based Rainbow Productions. However, the owners of the Wombles brand didn’t renew the license agreement when it expired on 30 June 2003. 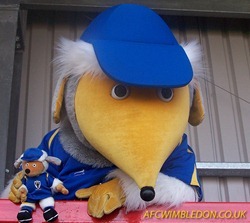 They no longer wanted the Wombles to be associated with Wimbledon FC as – despite its name – the club had relocated to Milton Keynes. The club is now known as the MK Dons. Wandle the Womble beanie toy, 15cm (Golden Bear, 1998) – is this the Tomsk beanie repurposed with a football strip? Haydon is the mascot of AFC Wimbledon (also known as the Dons), the football club formed by Wimbledon supporters in 2002 after Wimbledon FC moved to Milton Keynes. Named after Haydons Road railway station, Haydon made his debut in August 2006. You’ll find him at every Saturday home game, wandering around the terraces, encouraging fans. See Haydon’s profile on the AFC Wimbledon website. Where can you buy a Haydon the Womble soft toy? Hi Dan – you can usually buy Haydon merchandise from the AFC Wimbledon club shop, but it looks like they’ve sold out of toys at the moment.